Michael Jackson’s White Children Were Not His Own! OMG, Who Knew? The children’s mother reveals all. It was just too risky for any woman to give birth to a biological child of Michael Jackson, as the child could be born … “horrors of horrors” – BLACK. Michael was WHITE you know, so that would be a disgrace for any child of his to be born BLACK! After-all, not only was Michael Jackson WHITE, but all of his wives were WHITE! Meanwhile, America’s African American community is in deep morning over the loss of the music/dance icon who bridged the great American divide between Blacks and Whites by sacrificing his own skin color. During the campaign, Barack Obama promised many things to the America voters, and since even before the inauguration he has been working furiously to accomplish them. Of course, we all remember his Marxist promise to Joe the Plumber in 2008, when he said: “I think when you spread the wealth around, it’s good for everybody.” President Obama has already made good headway on accomplishing that particular goal. On 22 November 2008, a blogger listed the “194 Things Barack Intends To Do As President. He abstracted these promises, as he says, “verbatim from Obama position papers.” The blogger said that these intentions of Barack Obama had been consistent throughout his presidential campaign and were not only “sensible,” but “achievable.” He continued: “All that is required is a smart executive, a stellar team and robust grass roots support for change,” which we know well that Barack Obama possesses in spades. So, how’s that “smart executive” Obama doing on fulfilling his 194 goals in four years? Let’s see … that’s 48 1/2 goals per year, which comes to four per month. Obama has now been in office for five months, which means that he should have about twenty of these goals already accomplished, or else he stands little chance of succeeding in this lofty mission that he promised if American voters elected him. Which twenty of these lofty, if not worthwhile, goals has Barack Obama already accomplished, pray tell? I’ve read much of the list, and I cannot find even one success. Can you? Rep. Jesse Jackson Jr. Called for A Moment of Crotch-grabbing in Tribute to Michael Jackson. Today, the United States House of Representatives violated the Constitutional prohibition on mingling religion with government, by giving thanks to God for newly deceased pop star, Michael Jackson, whom Rep. Jesse Jackson Jr. of Illinois said not only “changed the world,” but changed himself from a Black man into a White … uh, um, ah, something or other. The Congressman requested all members to stand and offer a “moment of crotch-grabbing” in the House this morning as a tribute to Michael Jackson for establishing his Neverland Ranch as a place of refuge and love for young boys of all races and creeds, and for proving to those Americans born Black that they do not have to accept their fate, but can metamorphasize themselves into White folk and be proud. UPDATE: A Congressional Resolution Honoring Michael Jackson! Why does the FBI rail about music piracy, but ignore piracy of photographs? Isn’t it interesting that the FBI and everyone else is so uptight about copyright violation of music? Yet almost no one anywhere has respect for the “© All Rights Reserved” labeled photographs we amateur photographers upload to Flickr and elsewhere. I have found my © photographs taken from my Flickr photo-stream and used commercially without my permission, nor even credit given, at Ancestry.com (The Generations Network, Inc.) and Icanhascheezburger.com (LOLCATS). Amateur photographers such as myself upload photographs to share with others. We do not charge anything for you to view our photographs. We are not in the photography business; we just enjoy taking photographs and sharing them. We do not enjoy having those photographs stolen and used commercially by Internet businesses. Even though it is against copyright law to download our copyrighted photographs and then to pass them on to others as your own, with no credit to the original creator, it is rampant on the Internet. Sites such as Ancestry.com and Icanhascheezburger.com profit monetarily from our photographs that we never offered for sale. Those sites allow derivative products to be made from them, and then they claim ownership of our photographs and post warnings that it is illegal to steal “their” photographs, as both Ancestry.com (The Generations Network, Inc.) and Icanhascheezburger.com (LOLCATS) do at their sites. Ancestry.com (The Generations Network, Inc.) operates behind an expensive subscription wall, so that most Flickr members will never find their photographs that have been illegally uploaded there. While Flickr members allow their photographs to be viewed for free, when they appear on the Ancestry.com site, one must pay a subscription fee to view them. The Generations Network has contacted me and given me a link with instructions on contacting them about copyright violations: http://www.myfamilyinc.com/default.aspx?html=copyright . After performing all of the legal requirements that Icanhascheezburger.com (LOLCATS) required before they would remove my photograph from their commericial site, someone has advised me that they continue to brazenly store my photograph at their WordPress.com server. (I have since contacted WordPress and WordPress promptly removed the following photo.) http://icanhascheezburger.files.wordpress.com/2008/12/funny-pictures-cat-has-hired-a-substitute.jpg . Someone else has it stored at the Photobucket site. 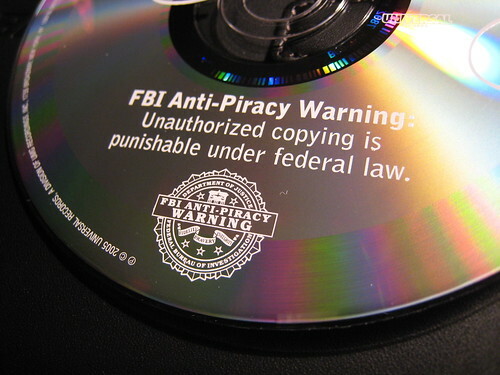 The image, FBI Anti-Piracy Warning!, is subject to copyright by bizmac. It is posted here with permission via the Flickr API by barneykin. How interesting that so many world celebrities were included in the “Famous People Painting.” Why there is Bill Clinton. But don’t bother searching for President Ronald Reagan, as he was omitted! Who was a greater influence on world history? Was it Bill Clinton and the infamous blue dress, or Ronald Reagan and the Fall of Communism? Was it Bill Clinton who saved his own hide, or Ronald Reagan who saved millions of humans from the degradation of slavery? It’s okay, Margaret Thatcher WAS included. Bill Clinton has his beloved saxophone, but I have no idea why he is holding a peeled banana aloft. Or is that a cigar? The Divine Comedy (available for “free” listening at Librivox.org) by Dante Alighieri (1265-1321). translated by Henry Wadsworth Longfellow (1807-1882). When is Water-Boarding Good? When used against Pro-life Christians, but only if they are drowned at the same time. That’s right folks. Although America’s Progressive Liberals have proclaimed water-boarding to be “Torture” when used against America’s terrorist enemies, the Pro-Choice movement has advocated the use of water-boarding against Pro-Life Christians, as long as the water-boarding results in drowning. That is because Liberal America considers Pro-life Christians to be the real enemies of their Liberal America nation. That is why children “of color” are being taught by Planned Parenthood to murder other Americans. Remember, water-boarding is supposedly “Torture,” but forcible drowning, as demonstrated to the children in this video, is still “MURDER” in America. Watch as Planned Parenthood water-boards and drowns (they call it “Aqua-sliding”) a Christian because he teaches abstinence and “dresses funny.” You will see peaceable demonstrators at an abortion clinic shot and killed en-mass by Planned Parenthood. Watch as they water-board a U.S. Senator until he agrees to support Planned Parenthood. If you watch until the end, when the credits roll, you will see Planned Parenthood shoot a U.S. Army helicopter out of the sky. It is proof beyond belief that the violence of abortion practiced at abortion clinics, against vulnerable women and the innocent unborn, promotes more violence against all Americans. This video is from Planned Parenthood of San Francisco, and was funded by American taxpayers who provide them at least $250,000 every year. Planned Parenthood’s Superhero for Choice kills pro-life Christians and abstinence educators in her never-ending quest to make America safe for abortion. The cartoon video’s message to youngsters “of color” is that white people are evil Christians and Planned Parenthood is their protector. Abort your babies “of color” now! If you wait, it will be too late, for they will be born into this wicked nation that water-boards its enemies. What kind of sick, perverts listen to David Letterman and laugh at his jokes? What kind of companies, besides CBS, support David Letterman’s misogynist and perverted views about women and children: David Letterman’s Advertisers. You are currently browsing the Kerfuffles and Flourishes blog archives for June, 2009.